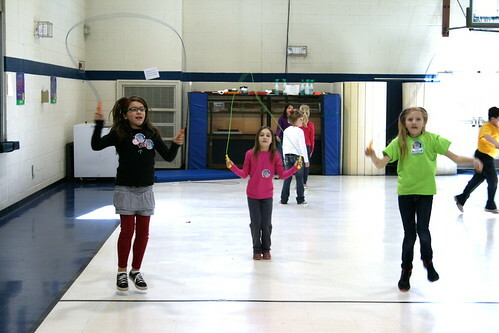 In Jump Rope / Rope skipping, double unders is one of the most famous skill. Which is kinda basic, but this is not an easy trick!! but do you know how to teach these advises for kids?? In Japanese elementary school, every child has to learn Jump Rope. And some of school set them a task to master double unders. It is not only their fault, but also teacher's. THEY JUST DIDN'T KNOW HOW TO TEACH !!! I saw a lots of those situations, which is very sad for me. Because I believe that everybody can do double unders, if they learn how to do. That's why, I started to spread my knowledge about Jump Rope. I have been doing competitive Rope Skipping more than 10 years. At the same time, I had been trying to visit elementary school to coach Jump Rope, of course double unders, too. I had gone around more than 300 schools, and taught double unders more than 100,000 kids. Also I had been studied about [How to teach Jump Rope] in Master degree, major of Physical Education/ Pedagogy. Please spread those teaching method. and send to everybody who want to do double unders by your hands!! Some of talented people can jump doule unders with any rope. but if you want to learn it faster, I strongly recommend you to use good rope. First of all, let's start to know what rope is good for double unders. If you use fabric rope, please stop using it ASAP. Because 'fabric' is the worst material for jump rope. The eassiness of turning rope is decided by 'air resistance' and 'weight'. 'Less seurface area' and 'heavy weight' is the best cobination for rope. In fabric rope, both elements are not good. Moreover, that is 'big surface area' and 'light rope'. If possible, none hollow rope is better. Because if the rope was hollow, the weight gonna decrease. The rope length is the most important thing even for competitive skippers. For double unders, my recommend lenght is like below. - handles gonna reach to yuor sholders. Also [Your height + 55cm(21in)] is the another good way to check. When you have too much lenght rope, it's hard to turn fast. This means it's not good for double unders. when you wanna make the rope shorter, how are you gonna do?? Don't you push the rope into handles?? When you wanna make the rope shorter, you need to cut the extra. Because if you push the extra rope into handles, the rope gonna be twisted and gonna impede to turn rope. It's enough about 2-3 inches for adjusters. My recommended handle is [long handle]. Even if your wrist moves small, long handles gonna transmit your enegy for turning rope. You need to keep the rope really good condition. This is very helpfull to learn any skill of jump rop. Good condition means [Straight and no twisting]. Especially vinyl rope is easy to get contortion. So, I recommend to keep rope with hanging. For example in your house curtain bar. If the rope got contortions, one of the solution is boiling. Prepare boiling water, and put rope in it. After few min, the contortions are completely gone!! After talking about materials, finally I wanna start training method. When you start training, please keep the steps on turn. If you don't like and skip something, you should get stuck again!! At first, let's practice to jump the rope faster. The goal is over 70 times in 30 seconds. If you don't jump faster than this, it's early to try double unders. "You need to turn fast as much as you can!!" Let's try to clap your hands two times in the air. This feeling is really close to double unders, and help your rhythmic ability. If you feel it too easy, why don't you try hit your knees two times in the air. This is little bit more difficult, also you can use it for kids playing!! It's getting closer. Already step3. In this step, I want you to try to jump silently like ninja. When people try to jump higher, they might be landed big noise. For skipping, this is not good. Because you can't continue the next one. So let's try to jump only with your toes. You don't touch your heel any moment. I know it's hard, but really need to jump like ninja for double unders. Now we reached step 4, which is start an attempt for double unders. In general, most of people who already can do double unders, strats double unders from basic jump. I don't care how many times, but I really want to decide how many times. If you decided 2 times, don't change it every double unders attempt. Because for double unders, you need to feel the timing to get into the skill. So it would help you to decide the times of basic jumps. This is the last step. You should be able to do double unders soon!! Now I'm gonna introduce the training method, which name is "Small Step Method"
This method had been created by Mr Oota, from Jyoetsu university in Japan. Let's start talking about "…", which shown in "A". This means 'not decided'. So you can jump rope any numbers. For beginners, it is hard to continue after jumped Double Unders because of the body balance. But even you lost your balance after that, it doesn't matter. The imortant thing is to continue. Even if any kind of off balance, you should continue next basic jump. That's the reason I made "…" point. After B--I is just like taht shown in the tables. The last step "J", you gonna try continuing two times. If you can, why not try three, four, and more!! Have you ever think about "how to grip handles"?? It seems too detail, but the effect is not small. If you grip handles like below, this is not good. Let's try grip your handle like the picture. I call this is "remote control grip"
It looks like useing TV remote control, doesn't it? Remote control grip helps to turn rope faster. Because the "thumb" makes power for the rope. Another griping way I would like you to try is "Mouse grip". I think I don't need any explain. Mouse grip is little different from remote control grip. You know, the first finger. When you touch first finger to the handle, it's gonna be easier to control rope. Hold your rope one hand and turn. - Turn rope as fast as possible. Such as you can hear rope sound "whoosh whoosh". - Try to continue 10 times more. - Try both hands. Easy to imagin that another handed hand is harder. - Try to turn with high jump. And make a "air double unders"!! Try to hold towel under your both arms. This is a good training for your arm positions. If arms are too wide, harder to do double unders. Try to keep arms touching your body. * it's OK to use any stuff you can prepare. such as "rope" or "hat". Try to make some knot in your rope closer to handle. One knot makes your rope 1 inch shorter. I recommend one by one knot for each handles sides. Usually, beginners rope are too long for double unders. If you believe you have better way to adjust, it's ok. But I think this trick is one of the easiest way to adjust. Once you fix your eyes position, your body balance gonna be fixed, too!! It doesn't matter to watch any thing. But try to really watching!! Jumping panel is a bord which helps your higher jump than usual. This is easy to make, you just get big bord and two pieces of basement. In jump rope, jump skill is not a big deal. The importance is how to turn and control rope. Jumping panel help your jump and you can learn easier how to turn the rope. Those methods are from many studies from all around the world. But unfortunatry, not so many people knows them. I would like to spread these method, and wanna help more people who try to do double unders. Hopefully, more and more people masters double unders, and gonna be love Jump Rope.